Texas Box of Love + SHIPPING ONLY $8! 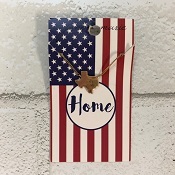 This "Texas Box of Love" is full of our favorite gifts to send to someone that is missing the Lone Star State or as a gift to an out of state client or friend - it's sure to impress! Our custom built Texas Box is filled with over $50 in hand picked Texas themed products including our Don't Mess With Texas Mug, a travel packet of Texas Tea, our most popular Texas Chili Fixin's packet, a box of delicious Texas Pralines, a magnetic Fixin' To Do list, a ceramic Texas shaped "Someone In Texas is Thinking of You" magnet and a Texas Bluebonnets seed pack! We picked these items so that they would be perfect to send to a family, as well as a male or female recipient of any age! 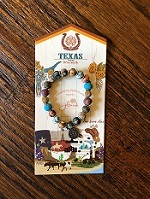 Our box is carefully packed with colorful Texas-motif tissue and colorful shred in an indestructible shipping box with a Texas inspired label on the outside announcing it's arrival from Gene Allen's Gifts! Send a "Texas Box of Love" to someone special and put a smile on their face! Gene Allen's "Box of Love from Texas" fine print: No substitutions, all sales final. Color/Design of items are subject to change based upon availability. ***Flat Rate Shipping ONLY $8 per box!